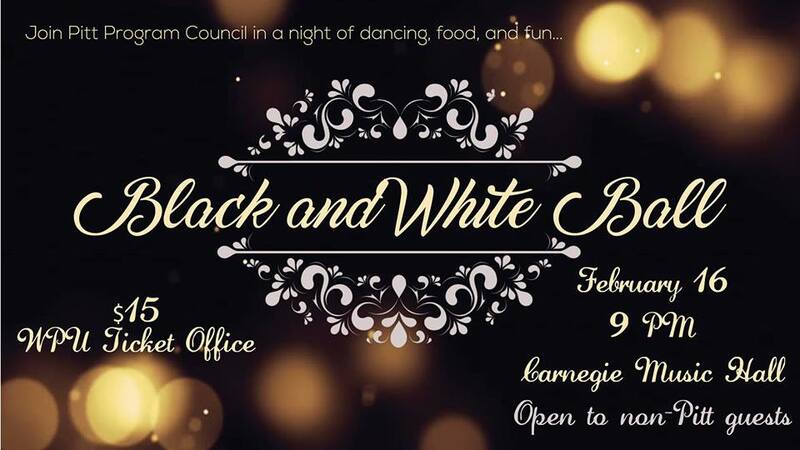 Join Pitt Program Council for a night of food, dancing, and fun at Black and White Ball! Our annual semi-formal dance will be taking place on Saturday, February 16th at 9pm in the Carnegie Music Hall. This elegant event will be catered with a variety of food that includes vegetarian and vegan options and a cash bar serving alcohol for students over 21. All attendees must bring a legal ID to be served. We will also be announcing the Bigelow Bash 2019 headliner at this event! Tickets will be sold in the WPU Ticket Office for $15 beginning on Monday, January 14th. Limit of two tickets per person. You must be a Pitt undergraduate student to purchase tickets, but guests do not need to be Pitt students.